Q: How do I use 24-hour Log? 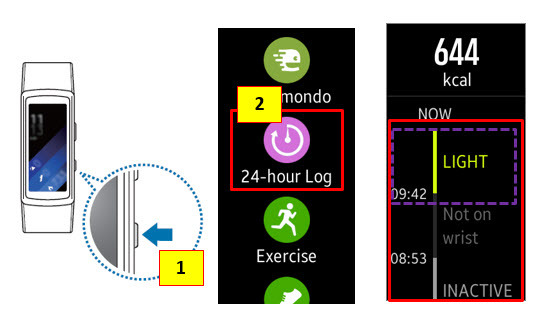 Tap 24-hour Log on the Apps screen. data on the basis of the current time. Tap an activity to view the details of your activity log. • Sleep: This indicates your sleep duration. • Light: This indicates the time you spent doing light activities, such as a light walk. • Healthy: This indicates whether you exercise with or without using the Exercise feature. Gear will prompt you to move after 50 minutes of inactivity.